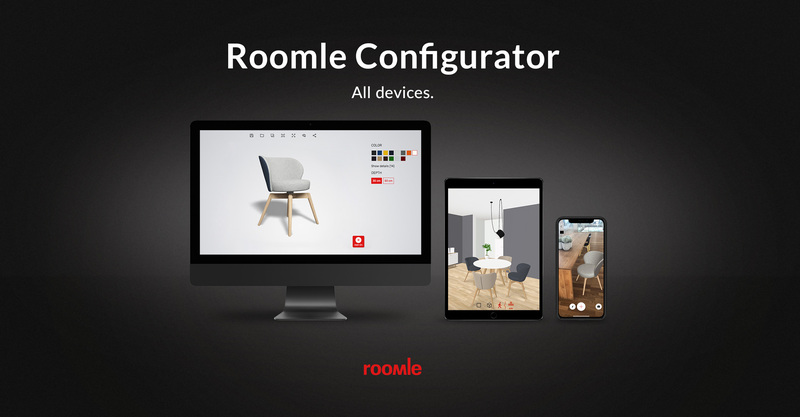 The new Roomle Configurator is simply an elegant, incredibly fast and visually breathtaking tool for the interactive 3D visualization of furniture. Upon closer inspection, it fulfills all the industry´s digitization visions and promises – in all dimensions of quality, speed and process efficiency. What did the furniture industry expect from the digital revolution? The end of paper catalogues. Customers configuring their shelves, settees and kitchens without the need for professional assistance. Error-free, automatized processes, from the user´s visions all the way to delivery. Producing furniture just in time, after the sale is completed. We have waited years for these visions to come true. Now they do. Roomle fulfills them all, and that is no coincidence. Error-prone complexity is now a thing of the past: Producers who wrestled with hundreds of colors, materials and configuration options to cover customer demands. Retailers who had to use hand-drawn sketches, cumbersome catalogues and hand-written part lists to boil the vast range of options down to an interior design - for customers whose visual thinking and decision-making capabilities were more often than not grossly overtaxed. The user experience is centered on a never before possible photorealistic visuals in AR-capable 3D: The Roomle Configurator creates furniture items in real-time from data, ready for inspection from all sides. For real `try before you buy´, users can insert Roomle visuals into views of existing rooms. The secret of the amazing visual quality is progressive optimization over a couple seconds. This keeps the 3D visualization agile and reactive, keeping up with changes in viewing angles or product configurations. All changes are immediately visible as sketches that progressively optimize to finest detail. The resulting quality is light years beyond all other available solutions on the market – literally, because the Configurator´s light settings would do expensive professional photography honor. - Roomle helps your products to really, really shine. Good news for those who have long anticipated the coming revolution: here it comes. 2019 Roomle will be on the spot at the most important furnishing show in the world's most important furnishing market - at the imm cologne. With 40 sqm at the Boulevard (stand 028), Roomle presents user-friendly options for the furniture buying process of tomorrow. See you there!